The 2017 Clyda Rovers Prediction League has reached a conclusion, with all 20 events completed!! Our final leader board is now available ! 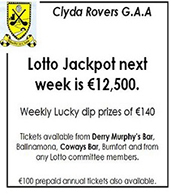 Congratualtions to our winner €300 David Hickey (seller Aisling Murphy), with €100 Derry Murphy (seller Derry Murphy) in 2nd place and €50 Michael Kenny (seller Chris Kenny) in 3rd place. A big shout out to Dan O'Connell (seller John Walsh) who wins €50 for the 100th place prize! There was a tie for 100th and Dan won on a count back!!! 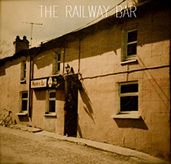 Thanks to the Murphy family of the Railway Bar for their generous sponsorship of the first prize! Q1. Age of winning horse in the 2017 Irish Grand National? Q2. Outcome of World Super Heavyweight Championship in Wembley? Q3. 2017 World Snooker champion? Q4. National League final total points (inc. goals) scored? Q6. 2017 European Rugby champions? Q8. No. of Irish players to start last Lions v All Blacks test? Q9. What golfer will be the 2017 British Open champion? Q11. 2017 Wimbledon Men's champion? Q12. Number of finishers in 2017 British Grand Prix? Q13. 2017 Women’s US Open champion? Q14. 2017 Women’s Rugby World Cup winners? Q15. 2017 All Ireland Senior Hurling champions? Q16. 2017 All Ireland Senior Football champions? Q17. 2017 All Ireland Ladies Football champions? Q18. 2017 Cork County Senior Hurling champions? Q19. 2017 Cork County Senior Football champions? Q20. 2018 FIFA World Cup Group D winner? 2017 Prediction League Final Table!